Published on March 22, 2017 in Resort Renovations and Winnipesaukee Resort. Closed Tags: Lake Winnipesaukee Resort, resort renovations, Winnipesaukee Resort. 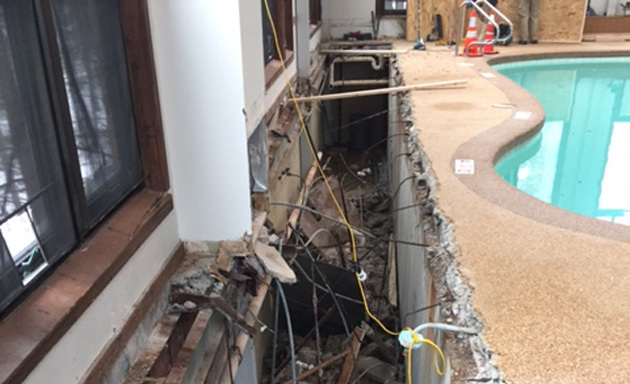 This spring kicked off with a bang at the Summit Resort with demolition of a major section of decking surrounding the large, indoor pool. In an effort to run new utilities for ambient heat and resurface the lower tier with fresh Pebble Tec flooring, our staff made quick work of the tear down process. Outside contractors have been brought in to professionally finish the balance of the project. Scheduled to be fully delivered by Thursday, April 13th, this major upgrade will ensure a new level of creature comfort for guests enjoying our star amenity. While the improvements might not visually stand out when finished, this is just one of the many details the resort tackles to ensure we deliver the best hospitality experience possible. Published on July 15, 2016 in Resort Renovations and Winnipesaukee Resort. Closed Tags: Lake Winnipesaukee Resort, resort renovations, Winnipesaukee Resort. 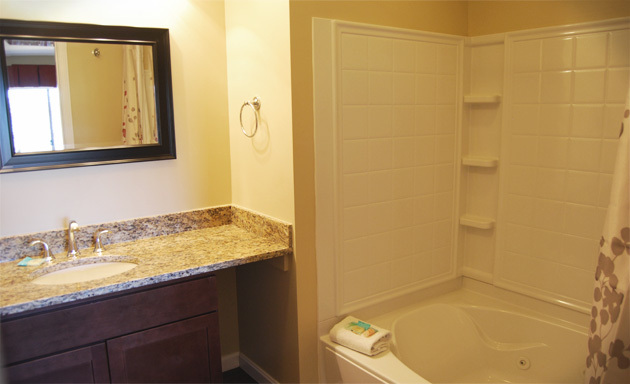 This summer season opens with major enhancements to the master bathrooms in our 2 Bedroom Deluxe Suites. When these units were originally constructed, the master bathroom included a large Jacuzzi tub with no shower facilities. Guests were there to enjoy a long awaited vacation and offering a large format Jacuzzi off the main bedroom was a fair tradeoff. After all, there was still a shower available in the guest bathroom. Times have changed and so haven’t the needs of our vacationers. In an effort to offer more flexibility and greater guest convenience, the resort embarked on a significant renovation project to completely retrofit the master bathroom facilities in the Deluxe Suites. The project involved completely gutting the bathrooms and removing the original large Jacuzzis. New whirlpool tubs along with full shower fixtures were installed in their place. Along with the new bathroom amenities, fresh vanity cabinets with granite countertops were added to upgrade the furnishings. New laminate, plank flooring and a fresh coat of contemporary paint colors finished off the conversion. With the renovation project fully complete, guests staying in our Deluxe Suites will enjoy these upgraded and inviting master bathrooms without needing to share a shower with their family or friends. This renovation is just one small example of the Summit Resort continuously improving to meet the needs of modern vacationers. Published on December 5, 2014 in Resort Renovations and Winnipesaukee Resort. Closed Tags: Lake Winnipesaukee Resort, resort renovations, Winnipesaukee Resort. Mentor Ave, the primary road leading to the Summit Resort, has been completely resurfaced and repaved. 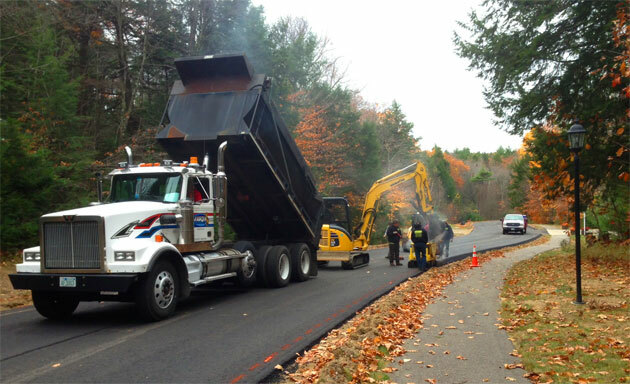 In November, Bryant Paving removed the 30 year old original surface and brought in bulldozers to further refine the grades. Along with a fresh layer of asphalt, new curbs were added along the edge of the drive. The repaving project marks a continued commitment to elevating the standards at our already exceptional facility. Along with the major room renovations currently underway, these overall facility improvements will help the Summit Resort continue to provide one of the best hospitality offerings in the Lakes Region. Published on June 19, 2014 in Resort Renovations and Winnipesaukee Resort. Closed Tags: Lake Winnipesaukee Resort, resort renovations, Winnipesaukee Resort. The Summit Resort is proud to introduce our new Signature 2 Bedroom Suites. Designed to set a new standard for accommodations in the Lakes Region, these immaculate new rooms are the pride of the resort. The byproduct of intense coordination between our management team and our contracting partners, these completely gutted and renovated 2 bedroom suites are guaranteed to impress our guests for years to come. Enjoy high-end details including spacious, modern kitchens with new appliances, granite countertops and built in breakfast bars to spend time with friends and family. Hardwood style, laminate flooring adds class and color to the kitchen and opens up to fresh carpets throughout the balance of the wide-open living space. All new furniture provides ample opportunity to kick back and watch a movie on the mounted flat screen TV in the living room. Additional features include mounted flat screens in the master bedroom and the guest bedroom, a Jacuzzi tub in the master bathroom and granite counters in both the master and guest bathroom. With a king bed in the master, a guest bedroom with 2 twin beds and a queen sized pullout sofa in the living room, the Signature Suites offer plenty of room for friends and family. 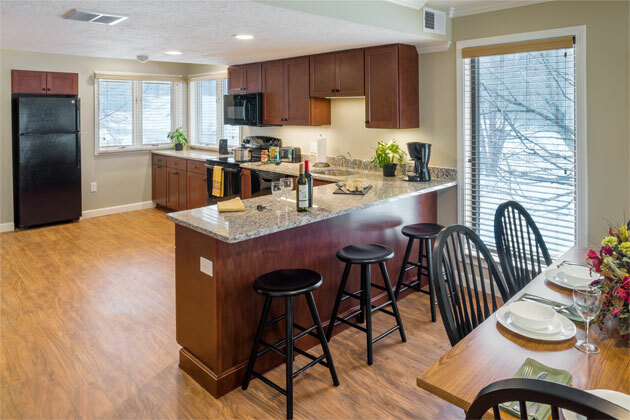 Situated in the heart of the Lakes Region near Weirs Beach, enjoy convenient access to all the local attractions and a true home away from home. The Summit Resort’s new Signature 2 Bedroom Suites offer the ultimate choice in vacation accommodations in the Lakes Region. Published on January 31, 2014 in Resort Renovations and Winnipesaukee Resort. Closed Tags: Lake Winnipesaukee Resort, resort renovations, Winnipesaukee Resort. 2014 marked a major step in the evolution of the Summit Resort. After an important vote by the association it was decided to embark upon the biggest renovations project in the history of the resort. This 3 year undertaking will witness a massive overhaul of the 2 bedroom suites at the Summit. Things kicked off with a bang in January. Contractor teams descended on the suites intent on gutting and transforming them into some of the best rooms in the Lakes Region. Granite countertops will be installed throughout the units. Hardwood-style floors will be added to class up the kitchen areas along with new cabinets and appliances. New carpeting, fresh paint, new valences, crown molding and brand new furniture round out a long list of improvements intended on raising the bar on the guest experience. Get excited to stay in style and prepare to be amazed by the finishing touches. This complete overhaul of the majority of the rooms on the property will set the Summit apart and make the resort a must-visit spot in the Lakes Region. Published on April 23, 2012 in Resort Renovations. 0 Comments Tags: Lake Winnipesaukee Resort, Renovations, Winnipesaukee Resort. The indoor pool area is in great shape for the busy season. This quick video shows a behind the scenes look at our recently finished maintenance overhaul. 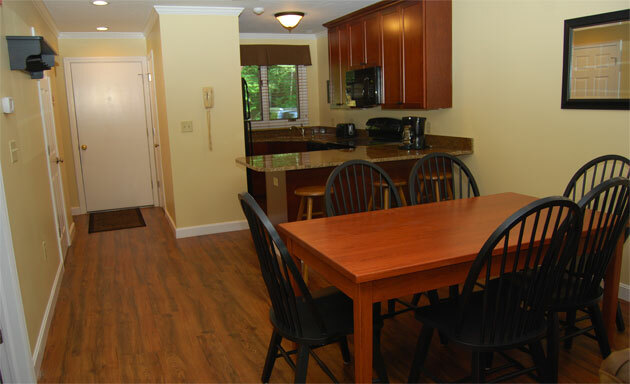 At the Summit Resort we take pride in our amenities center. Our indoor pool area is truly a top-notch facility. Kids love the 2 watersides and adults enjoy basking in the large roman spa or relaxing in the grotto area behind the waterfall. Needless to say, guests appreciate the pools and as a result they see a lot of traffic over the course of a year. As part of our yearly upkeep, our maintenance staff recently went to work draining the pools, stripping the lights and grinding down the base layers to put things into ship-shape for the new summer season. Thanks to the hard work of our painter Frank and our Head of Maintenance Roland, all of the pools received a fresh resurfacing to compliment the new flooring we put in a few years back. Needless to say, the facilities are in great shape. If you are interested in seeing the pool area for yourself, don’t hesitate to check out one of our package deals. We hope you enjoy it as much as we think you will.